Kerlin Gallery is pleased to present Nicholas Keogh - part three of Fortnightly Features Presents. 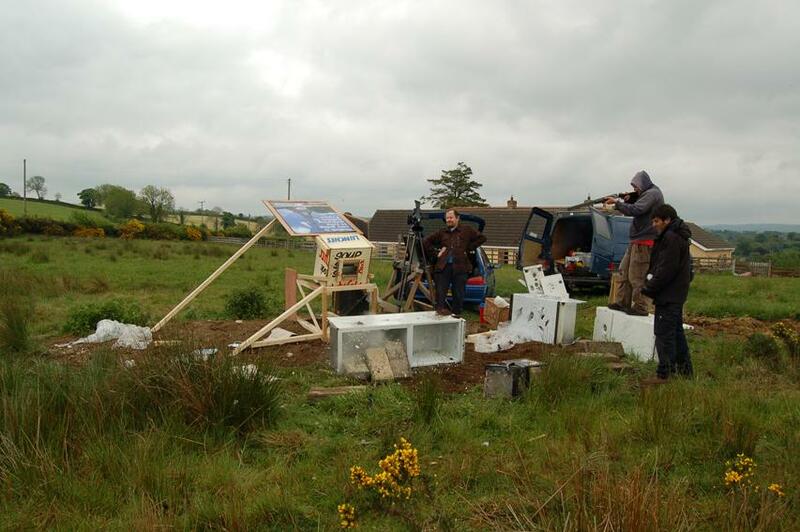 Belfast-based artist Nicholas Keogh works in film and sculptural installation. Incorporating wit, music and the absurd, he presents us with an alternative view of the everyday, re-imagining human relationships, places and situations, skewing logic and reason with a startling disregard. Keogh presents a series of three films; 'A Removals Job’ celebrates the camaraderie of a group of workers and the unspoken exchanges between them. The film follows the household clearance of a traditional two-up, two-down red brick terrace in Belfast. At first, the movements of the workers are erratic; only after an understanding of each character has been established is order restored. Their movements are subtly choreographed, producing a seamless flow of objects that slot perfectly into a skip — reminiscent of the classic 1990s computer game Tetris. 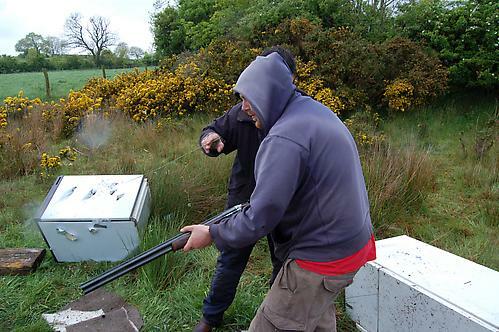 The strange and darkly humorous ‘A Film About Bluebottles’ documents a ferocious yet simultaneously ridiculous act - the shooting of bluebottles that land on fridges in a field. The violence of the shotgun lies in stark contrast with the inane movements of the insects; the raging impact against the slight, frenetic flies. Keogh’s latest film ‘Schumacher’ featuring Brian Brown, premiers at Kerlin Gallery. Beginning as a seemingly vital, intense confrontation, with the actor speaking direct to camera, the film swiftly changes gear, switching tone and perspective and ultimately confronting the viewer themselves with their own preconceptions and assumptions. Keogh’s sculptural installation features ‘Bin Disco 5’, the latest in a series of ‘Bin Discos’, the first of which was built in 2003 after returning from a trip on Rathlin Island. The ‘Bin Discos’ are portable sound systems made from elaborately converted bins, originally created for illegal alleyway parties. ‘Bin Disco 5’ was originally built for Manifesta 5, Donostia-San Sebastian in 2004, and uses ‘Patchblock’, some of the newest sound equipment currently being developed in electronic music. Nicholas Keogh has exhibited widely, with recent exhibitions including Golden Thread Gallery, Belfast (2014); Rua Red, Dublin (2014); CCA Derry-Londonderry (2013); Northern Gallery for Contemporary Art, Sunderland (2013); Tulca Visual Arts Festival, Galway (2012); The MAC Belfast (2012); L’ art contemporaneous Europe experience Pommery #5, Rheims, France (2008); and Location One, New York City (2007). Keogh’s work has also been included in numerous screenings including Glasgow Short Film Festival, CCA Glasgow (2014); FILMETS, Badalona Film Festival, Barcelona (2014); Encounters,short film festival, Bristol (2013); Corona Fastnet Short Film Festival, Cork (2013); Puerto Rico International Short Film Festival-Cinefiesta (2013); and bang! Short Film Festival, Nottingham (2012). Keogh represented Northern Ireland at the Venice Biennale in 2005. He is a graduate of University of The West of England, Bristol.